The perfect fidget for all ages! The perfect fidget for all ages! Fun, colorful, soothing, mesmerizing, practically addicting, and one of the coolest fidgets available! Sure to keep users engaged when stressed, bored, or seeking sensory input and perfect for clients with autism and sensory integration disorder. Improves focus and concentration while exercising fine motor skills. 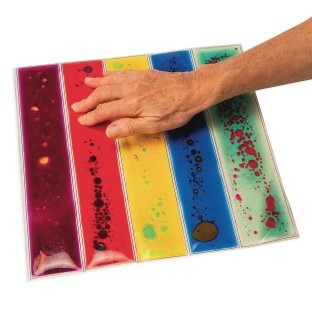 Made of a clear PVC material with non-toxic, colored oil and water filling. Measures 10-3/4” square. Easily wipes clean. Colors may vary.